Sometimes certain user actions are scary, though harmless. For example, cancelling an online booking request might seem twice as painful as the SDL Tridion BA certification exam (so a TBACE factor of 2). Pick the right dates at a reasonable fair, balancing pain of the trip with what fit corporate travel guidelines. Request approval from one of the office superstars. I'm not sure about anyone else, but if it wasn't for GPS and online booking services, I'm not sure I'd be a consultant. For example, my trip to Amsterdam last year was pretty much, "Alvin, book a flight to HQ for these dates." I confirmed the details of course, but Google and GPS confirmed I had the right office, that the shady cab driver got me to the right hotel, and pointed out I took the wrong train to the office as my blip got farther away from the office. And because my respect for the approving superstar outweighs the pain of re-booking, I was apparently the first to click a fairly scary option called: cancel approval request. Wait, what happens if I click that? Apparently not much. Go ahead, try it! If I need to choose a certain value or enter a certain type of data, the "system" should provide me a drop-down or otherwise "know" this information already. If such an integration is not possible, I or an authorized user, should be able to update this project-related information independent of the request. Knowing that these first two are very specific to my company-as-a-customer-of-another company (there isn't one content model for all and maybe making this configurable is a huge hassle), I'll settle for the next best thing: please let me know what "cancel approval request" means. Oh, easy. I can update the details and re-request approval now. 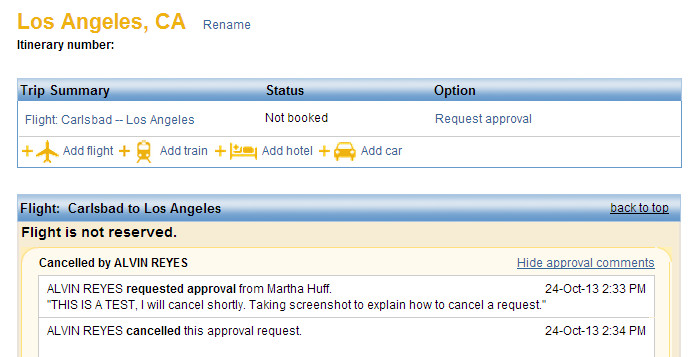 Whew, cancel approval request only cancels the approval request, it's so obvious! But I know I'm not the only one wondering because I've had two colleagues ask how to do this. "cancel approval request (but keep request details)"
Re-requesting for approval will show it was "cancelled" but I can submit anyways. Assuming the flight is still available, the entire process is painless (though I'll pay attention next time). What I was really afraid of was the following link. Deleting a flight from my itinerary would force me go through the hassle of choosing an ideal flight among what feels like an infinite set of flight options. It's the painful paradox of choice wide-open self-service sites inflict on business travelers. These screenshots were all a test, sorry, no plans to go trick-or-treating in LA this Halloween. So there you go, no matter how obvious "cancel approval request" seems different than "cancel flight," a little information could go a long way. So don't be creepy and definitely don't be scary. 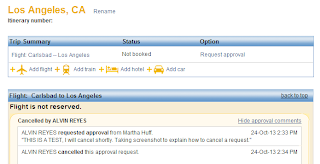 Update: If a flight is already approved, pressing "cancel flight" it will cancel and remove the flight from your trip. However, you will get the option to re-enter project details before picking your seats.